When you have dinner parties there are two concerns you probably have – that you have to cook in large volumes and that it has to be fun for your guests. Sure, a potluck is the easiest, but it’s not the most exciting. If you’re looking to throw a dinner party that’s one of the highlights of the year, you’ll need good kitchen equipment for entertaining several people. There are some gadgets that are particularly appealing at Christmas time. If your guests like to participate in the preparation of their food, it can be a lot of fun and can lessen the burden on you as the hostess. Our list of kitchen tools for holiday dinner parties also serves as a list for holiday gift ideas for the hostess of the party. The next time you’re invited to a dinner, take something more inspired than a bottle of wine or flowers. The following hostess gifts for Christmas are sure to be used often by the recipient. Enjoy hand-dipped chocolate desserts any time of the year, but they’re especially good during the holidays! Chocolate fondue done right is always a good idea and the Wilton Chocolate Fountain can make it happen. You won’t have to worry about making dessert. Just provide your guests with strawberries, cookies, marshmallows, etc. and have enough fondue chocolate to melt. The fountain consists of three levels and can hold up to 4 pounds of melted chocolate, so it looks quite wonderful when the chocolate flows over. The feet are adjustable and there’s a bubble level to help you set it up straight for use on any table. It measures 16.75 inches high and is 12 inches in diameter. All the removable parts are easy to clean by hand. To use, simply turn the dial to “preheat” to melt the chocolate and when you’re ready to start dipping, set the dial to “flow”. You must use only fondue chocolate and you get a 2-pound bag of Wilton Fondue Chocolate along with this set to start with. Regular chocolate will need oil added to it. We’ve covered a chocolate fondue fountain, but what if you want to do all kinds of other fondues too, like cheese, broth or oil? While you can’t use a fountain for these (boiling oil and cheese is dangerous to have flowing down a fountain! ), an electric fondue pot can and you can use it for chocolate too even though you won’t get the visual fun like with a fountain. The Cuisinart Fondue Maker is an elegant brushed stainless steel set that comes with a base, a 2-quart non-stick pot, 8 color-coded fondue forks, a fork rack and a temperature probe. If you want to use recipes that require a specific temperature range, you can use the temperature control. It is removable if you don’t need it and when it’s time for clean up. The entire set can go in the dishwasher. There is no need to preheat ingredients on the stove, as this is an energy efficient unit. For example, heating oil to 375 F takes between 10 and 15 minutes. For chocolate, just start with a little bit of cream before adding the chocolate and it will melt easily. We have reviewed some more great models of fondue makers to try. With a fondue pot, you can have just one type of cheese or mixture of cheese at a time. If you want to sample a variety of cheeses with various ingredients, a raclette grill is a better choice. 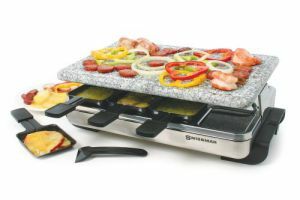 With the Swissmar Stelvio Raclette Party Grill, you have a granite stone top on which meats, veggies, bread, etc. are grilled, while underneath are 8 raclette dishes to hold a number of melted cheeses or even keep sauces and aioli warm. Each dish has its own spatula for serving. The stone’s heat is regulated by a dial, with its highest setting being good enough for grilling any meat. The stone, dishes and spatulas are all dishwasher safe, while the stainless steel base can be wiped clean with a damp cloth. Take a look at a few other good Raclette party grills. You can use a blender to make frozen drinks, but making several servings can take time, as you have to measure out ice and other ingredients everytime the pitcher needs refilling. Also, a blender crushes ice instead of shaving it, which is the preferred method by bartenders. Instead, the Margaritaville Bahamas Frozen Concoction Maker & Mixer comes with an ice reservoir that has an ice shaving blade, a 36 ounce blender jar for thoroughly blending ingredients, and a mixing tool with easy to use measurements markings for ingredients that you use in daiquiris, pina coladas and margaritas. To start, set the mixing jar over the blender jar with the bottom of the mixer closed and add the ingredients in the right order using the markings for your chosen drink. Then release the ingredients into the blender jar, close and set it on the Bahamas stand. Make sure the ice reservoir is filled with ice cubes. Now you’re ready to start blending, so you can either use the automatic shave and blend setting, or manually control each cycle if you want more or fewer ice shavings or you want to blend less or a little more. Want to see more machines like this? We have a few more frozen margarita machines that are really good. A slow cooker is great for cooking for parties, as you can start a dish early and let it cook while you get ready with everything else. During the dinner, it can be used to keep the food warm. With the Crockpot Hook Up Connectable Entertaining System, you can do this but with several dishes at the same time! There are 3 different sized pots in this system (1 Qt, 2 Qt and 3.5 Qt) and you can buy 1 or more in any combination and they will all connect with each other so you can create a buffet line of finger foods, sauces, stews, stir fries, etc. for your party. Each crockpot has a special cord that can be plugged into standard power outlets or can be stored underneath. A connecting outlet connects two or more units together. Each stoneware pot can be set to high, low or warm and each comes with a glass lid. Both pot and lid are dishwasher safe. The units are stackable for easy storage. The Pizzarette is a countertop mini pizza making oven that’s a lot of fun to use by guests at a party so that they can make their own customized mini pizzas. ← What is the Best Food Processor Under $100?